The Fidelity Select Multimedia Portfolio fund objective is to provide capital appreciation. The fund usually invests most of assets (>80%) in securities of companies principally engaged in the development, production, sale, and distribution of goods or services used in the broadcast and media industries. This Fidelity stock fund may invest in securities of foreign issuers. The fund uses fundamental analysis of factors such as each issuer's financial condition and industry position, as well as market and economic conditions to select investments. It is considered as non-diversified mutual fund. Kristina Salen has managed this fund since September 2006. This Fidelity sector stock fund was introduced on June 1986. This fund has an expense ratio of 0.96% per year. As a no load fund, this best rated fund doesn’t charge any front end sales load or deferred sales load. It only has a small yield of 0.25%. The minimum balance to invest in this fund is $2,500 for brokerage account and $500 for IRA account. This fund requires no minimum subsequent investment. This fund can be purchased from 63 brokerages, such as Vanguard, JP Morgan, T Rowe Price, Schwab Retail, Ameriprise Brokerage, E Trade Financial, Td Ameritrade Inc, Royal Alliance, EP Fee Large, Firstrade, Ameritas NTF, etc. This FBMPX fund has returned 43.05% over the past one year and 5.30% over the past ten years. The best performance of total 1-year return was recorded in 2009 with 54.41%. The year-to-date return of this fund is 12.53%. It has 18 years with positive performance and 6 years with negative return. Therefore it obtained a 4-stars Morningstar rating. There is no other class available for this fund. As of June 2011, the asset allocations of this Fidelity fund are 94.43% in domestic equities, 5.38% in international equities and 0.19% in cash & net other assets. Up to June 2011, this FBMPX fund has 54 holdings. The top ten holdings equals to 65.37% of the total portfolio. They are Disney (Walt) Co, Comcast Corp Class A, Time Warner In, Directv, Viacom Inc, News Corp Ltd, Time Warner Cable, Virgin Media Inc, CBS Corp and Comcast Corp Class A Special. 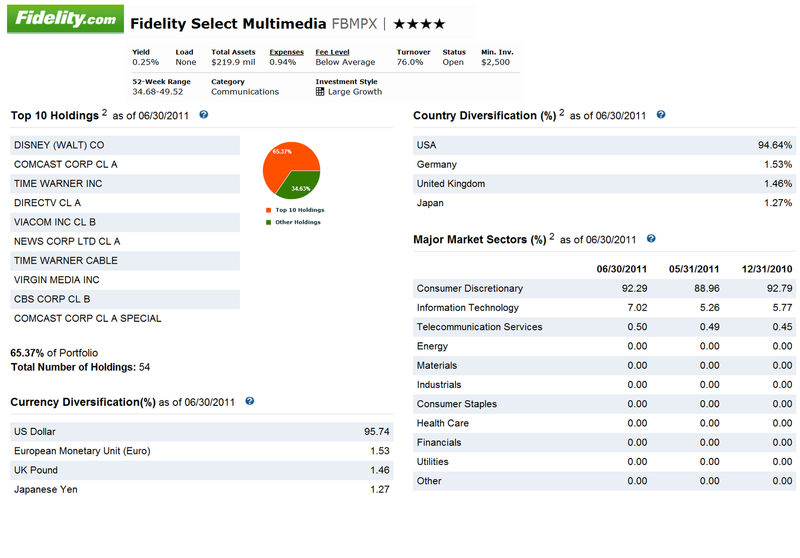 The country diversification of this Fidelity Select Multimedia Portfolio fund is USA (94.64%), Germany (1.53%), United Kingdom (1.46%) and Japan (1.27%). And the top major market sectors are Consumer Discretionary (92.29%), Information Technology (7.02) and Telecommunication Services (0.50%).